The town of Oristano on the island of Sardinia host an annual event called Sa Sartiglia, which is filled with pageantry and history. This three-day event starts on the Sunday before Ash Wednesday and ends on Shrove Tuesday, which in Italy is referred to as Carnevale. First written proof of Sartiglia can be found in historical documents from 1543, but this most likely started in the Middle Ages. The main events are held on Sunday and Tuesday. Sunday's events are performed by the guild of San Giovanni (dedicated to farmers) and Tuesday by the guild of San Giuseppe (dedicated to carpenters) each preside over one of the events. Each guild selects a knight based on his riding prowess to be Su Componidori (head of the joust). Trumpeters and drummers lead the cortege from the house of Su Componidori to the area where they will have the traditional dressing of the Componidori. The cortege consists of massaieddas (young girls wearing the traditional costume of Oristano, carrying the clothes for Su Componidori on flat baskets called corbulas), Sa Massaia manna (a woman who oversees the dressing ritual to make sure everything is followed according to the rules of the event), guild members (carrying swords and wooden lances to be used in the race) and finally Su Componidori. The dressing ceremony is done on a platform called a Sa mesitta. 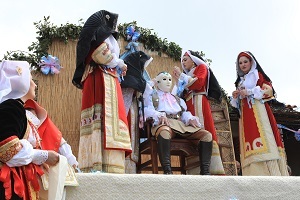 Once the Componidori gets on the platform he will not be allowed to touch the ground again until the Sartiglia has completed. The dressing ceremony is one filled with tradition and will take over an hour to complete. Each item of clothing is meticulously put on the Componidori. Each guild has specific garments and colors that they use. Ribbons are tied and hand sewed to secure the puffed sleeves of the white shirt. Red ribbons are used on the Su Componidori for the Guild of San Giovanni. Pink and light blue are used by the Guild of San Giuseppe. An earth toned mask is used by the farmers guild while the carpenters guild uses a white one. The dressing ceremony is complete once the camellia (red flower on Sunday and pink on Tuesday) is sewn on the breast of the Componidori. The Componidori's horse is lead to the platform where he will mount him. The horse's bridle is beautifully decorated with flowers. He is handed the Sa Pippia de Maiu (the May girl), which is a bunch of periwinkles and violets wrapped in green cloth. The Componidori will bless everyone at the dressing ceremony before he rides off to meet his two aides-de-camp, and fellow knights all dressed in medieval costumes with their faces covered in eerily looking masks, to bless them. As the Componidori makes his way to the via Duomo he will bless everyone on the route. Once they arrive to where the joust will take place the Componidori will do the traditional sword crossing three times. He will meet his second in command directly underneath the sartiglia (silver star with a hole in the center) that hangs over the track 3 meters above the ground where they will cross swords. This marks the start of the competition. 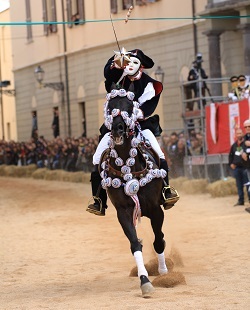 The Componidori will get the first chance to use his sword as he gallops at full speed aiming for the hole in the sartiglia hoping to connect and cause the star to break off and slide down the sword. The sounds from the crowd cheering for success and groaning for failure will fill the air of Oristano. Each rider will have the opportunity to capture the star. The number of riders is determined by the Componidori so it will vary each event. 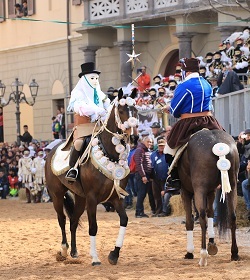 After each rider takes their turn the Componidori will exchange his sword for a wooden lance and take another stab at capturing the sartiglia. Only Su Componidori and his two aides will have the opportunity to use the wooden lance. The more stars captured the greater chance for a good harvest and good fortune for the townspeople. The joust comes to an end when the Componidori takes back the Sa Pippia de Maiu and performs the Sa Remada, which is one last gallop down the track laying back on his horse blessing the crowd. The scene then shifts from via Duomo to via Mazzini where Le Pariglie will take place. 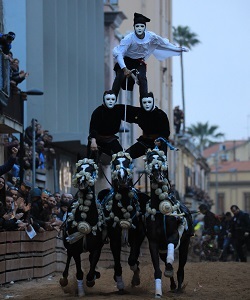 To open this event the Componidori is flanked by two riders who take the reins of his horse and as the three gallop down the track the Componidori places his hands on his fellow riders shoulders. Riders will perform horseback stunts and different equestrian acrobatics to the applause of the crowd. These stunts are one you don't want to miss as the riders' practice for months to make sure they give the crowd a show to remember. Like the joust this event comes to an end when the Componidori preforms the remada. This time he is once again flanked by two riders as he lays back on his horse blessing everyone with his pippia de maiu. Photo copyright © Fondazione Sa Sartiglia Onlus. Used by permission. All rights reserved.